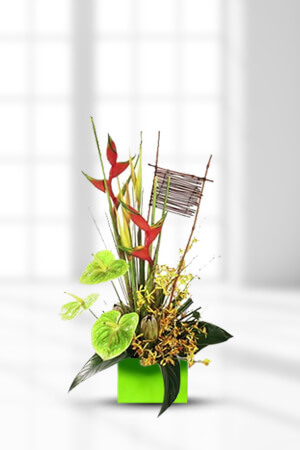 This exotic arrangement really does have a touch of mystery surrounding it. Its adventurous design contrasting with its soft colours really does make it a unique arrangement. The balanced aesthetics in the floral design might even improve the health and wealth in your life, by giving you positive energy.If you would like to make your gift extra special, why not add a box of chocolates with your order? For Feng Shui, our customers chose the Standard option. Excellent service thank you Warm regards Stefania ?? Excellent communication. My mother was delighted with the special arrangement she received. Many thanks. Easy ordering. Got a photo from the recipient. Lovely flowers, better than the website photo.